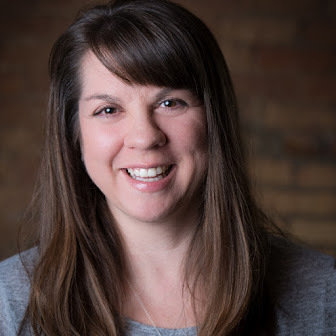 As a proud Barlean's Ambassador, I want to thank them for sponsoring today’s post. All opinions, as always, are my own. 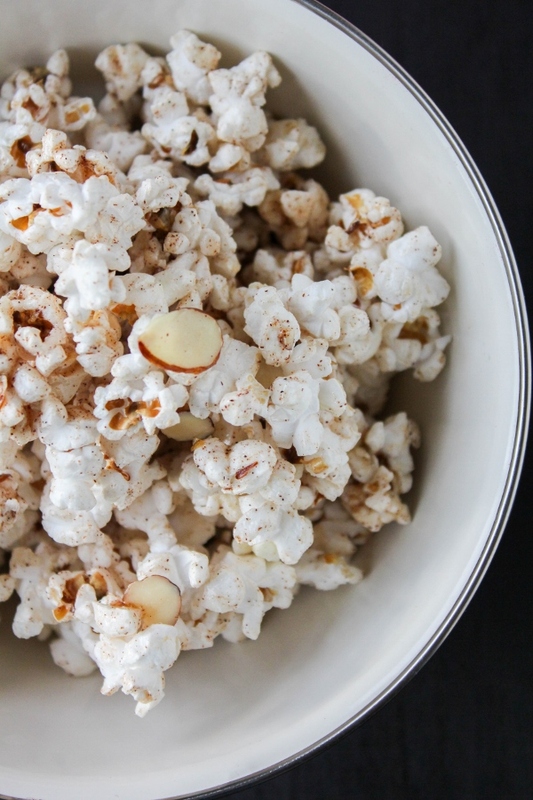 Satisfy both your sweet and salty cravings with this simple and delicious Cinnamon Almond Popcorn! It's a wholesome snack that the whole family will love. Hey friends! I hope you all had a fabulous long weekend. I apologize for being kind of quiet, but life has been crazy busy over here. This past weekend I didn't do much relaxing, I worked a bunch outside getting ready for E's graduation party this Saturday. There is so. much. to. do. We pulled weeds, planted flowers, prettied up the landscaping, and so on. It was a hard few days on my old back I'll tell you that! But the yard looks great and that's one less thing to worry about. Starting tomorrow I'll be focusing on cooking since my mom and I are making all the food for the party. 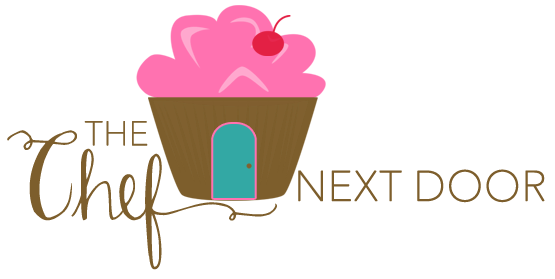 Pulled pork, summer salads galore, fruits, veggies, and yummy desserts. I'm tired just thinking about it! In the midst of all the craziness over the last few days of course I also had a chance to chill a little bit, mostly in the evenings. The kids and I watched sports and movies and enjoyed some snacks. You already know my most favorite snack ever is popcorn, so of course I had bowls of that on hand. My sweet tooth was nagging me too, so I decided to shake things up and make this Cinnamon Almond Popcorn. It satisfies the sweet and the salty cravings and is just downright delicious. Plus, it couldn't be easier to make! 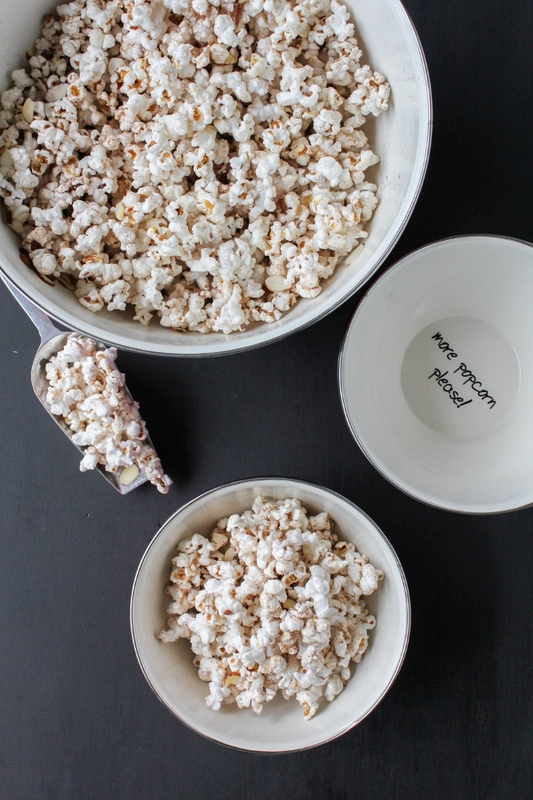 I have a stove-top popcorn maker that I absolutely adore and use all the time, but you can make your popcorn any way you please. 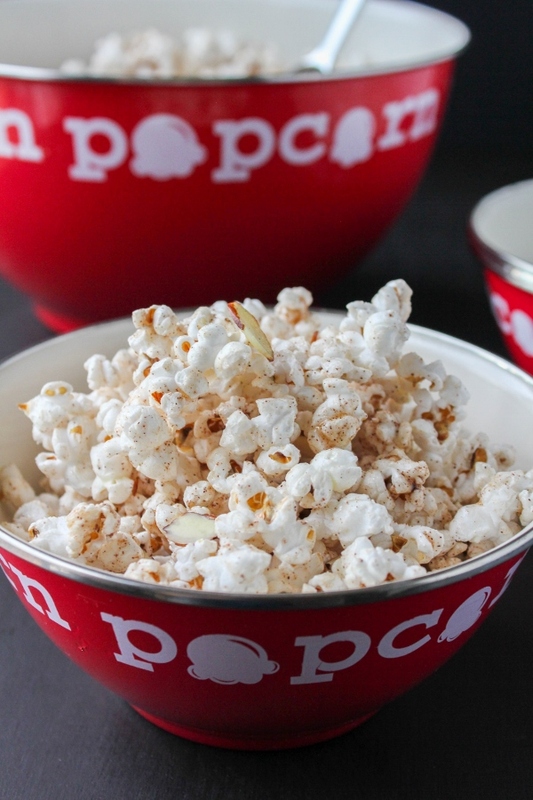 You will just need 8 cups of popcorn for this recipe. If you're popping it yourself, that's about 1/2 cup of popcorn kernels. If you use microwave popcorn, two standard size packages will give you about 8 cups. See how easy that is? For the topping it's easiest to toss everything into a small saucepan and warm it on the stove until melted and combined. 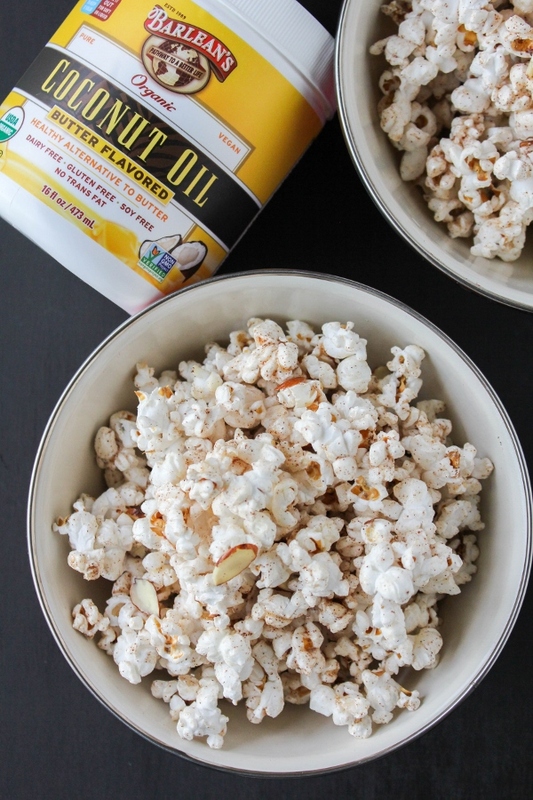 My absolute favorite thing to use for my popcorn is Barlean's Butter Flavored Organic Coconut Oil. It has all the health benefits of coconut oil but with the rich taste of butter. It's light and smooth and can be used in cooking, baking, and even frying! I love it on my baked potatoes as well as cooked vegetables. 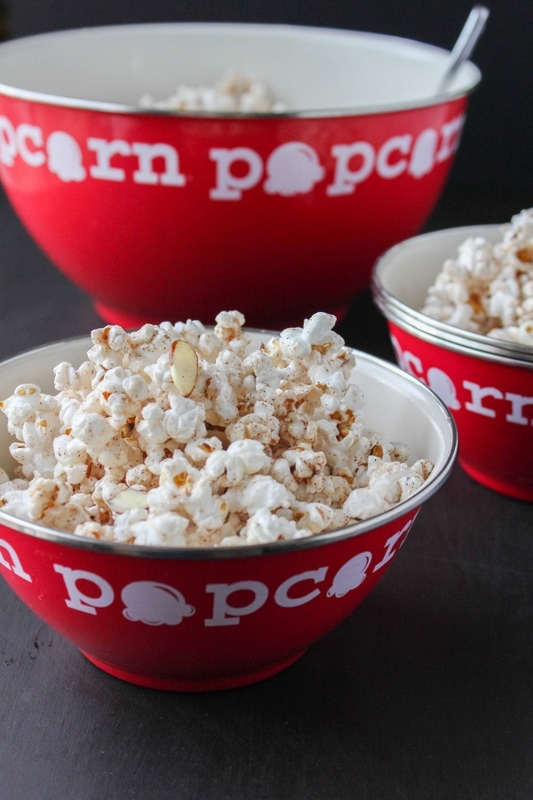 This recipe makes a large batch of popcorn, which is perfect for the family. Trust me when I say it's addictive! It didn't take long at all before the kids and I had devoured this whole bowl. Add the honey, coconut oil, cinnamon, and salt to a small saucepan. Cook over low heat until the mixture is warm and smooth. Pour the popcorn into a large bowl. Drizzle half of the sauce over the top, then gently toss to coat. Add the remaining sauce and sliced almonds and again, gently toss to coat. You can also you a spoon to carefully mix it all together, if needed.